Density of population means the average number of people living per square kilometer. Punjab is the most densely populated province in the country. 254 persons live per square kilometer in Punjab. The most densely populated region in the province in Lahore Division, where the densely of population is 3506 persons per square kilometer. In Faisalabad Division, the most densely populated region is district Faisalabad where the density of population is 912 persons per square kilometer. In Gujranwala Division, the most densely populated area is Gujranwala where the density of population is 931 persons per square kilometer. The less densely populated areas of Punjab include Bahawalpur, Muzaffargarh, Dera Ghazi Khan, Attock, Jhelum and Rajanpur. 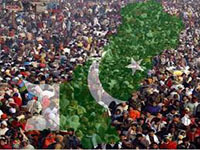 After Punjab, the next most densely populated province is NWFP, where 236 persons, live per square kilometer. The most densely populated region in the province is Peshawar where 970 persons live per square kilometer. Other densely populated areas are Mardan, Bannu, Malakand and Dera Ismail Khan. The less densely populated areas include Swat, Dir and Chitral. 23 per cent of the country’s population lives in Sindh, where almost 212 persons live per square kilometer. Karachi Division is the most densely populated region of the province. In Karachi, the density of population is 278 persons per square kilometer respectively. Tharparkar, Khairpur, Sangar and Thatha are included among the less densely populated regions of the province. Among the four provinces of Pakistan, Baluchistan has the largest area but the smaller population. Kharan and Chaghi etc. are its least densely populated regions while Quetta ranks first among the densely populated areas. In Quetta 286 persons live per square kilometer while in Jafarabad, the density of population is 172 persons per square kilometer. Real Life Mermaids Caught On Camera - MUST SEE! Amazing videos of the world!!! 10 Most Disgusting Videos Ever Caught On Camera!